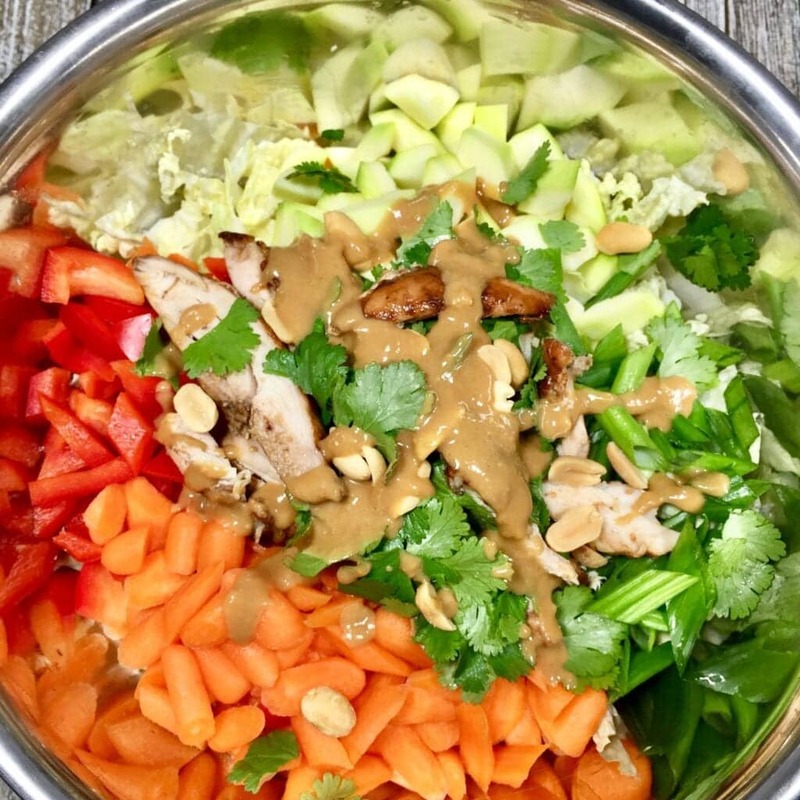 This Thai Chicken Salad is perfect for any time of the year. It’s packed with healthy vegetables and since it calls for Rotisserie chicken, it’s super fast and easy to make. 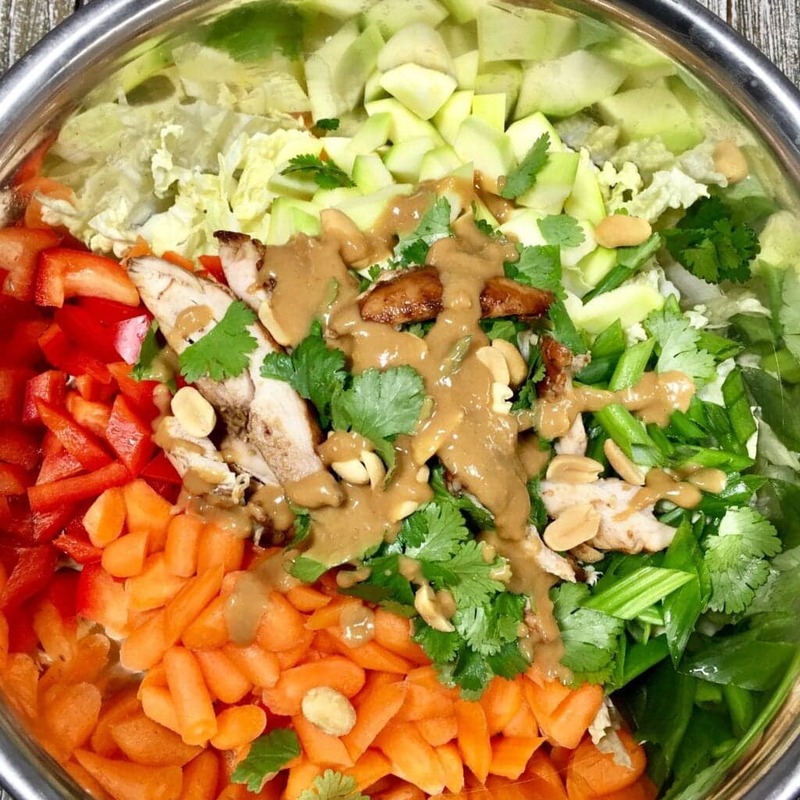 I’m really hooked on this Thai Chicken Salad. First, because I absolutely love vegetables, especially when they’re wonderfully fresh and crunchy. Next, it’s fast and easy because one ingredient is already cooked rotisserie chicken. Then there’s the rich, totally satisfying Peanut Dressing. It’s savory and tangy and well, just perfect. 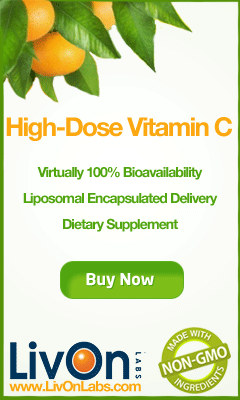 Don’t be put put off by the number of ingredients. Yes, the list is long but it’s mostly due to the peanut dressing. Of course, that’s what makes this salad so fabulously wonderful. Once you have all of these ingredients together here comes the easy part. Just putting it all together. 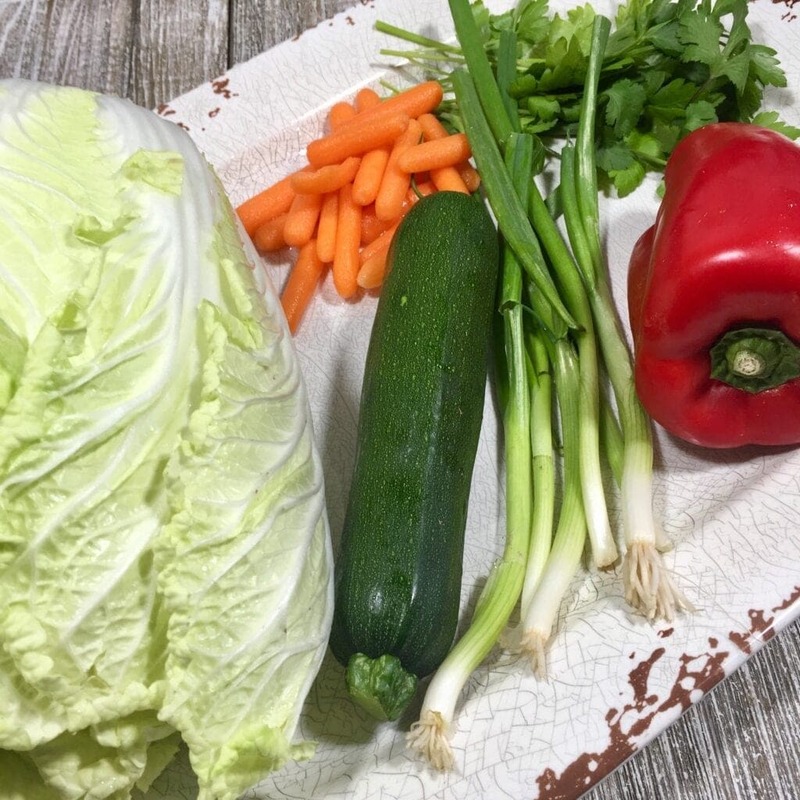 For the salad just add shredded Napa cabbage to a serving bowl. 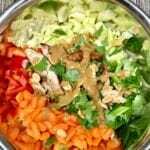 Then add the shredded chicken and the diced carrots, scallions, cucumber, red bell pepper and cilantro leaves. After the salad ingredients, here comes the dressing. Just add the peanut butter, either crunchy or creamy, rice vinegar, lime juice, vegetable oil, sesame oil, soy sauce, honey, garlic, ginger (freshly grated is best), salt and red pepper flakes to a processor and mix to blend. Then just just drizzle that wonderful over the top of the salad and top it with some peanuts and cilantro (or not). Me? I’ll always go for the cilantro. A quick word about the cilantro. There’s two schools of thought on cilantro. You either hate it or you love it. Me? I love it and have ever since I had the first bite of a California Pizza Kitchen Asian Salad. However there are those who despise it. Julia Child And Ina Garten for instance. 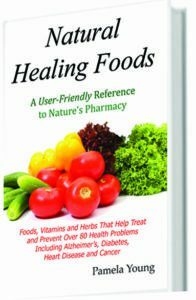 National Public Radio even did a whole study on it. So, I’ll say it’s optional if you want the cilantro in it. 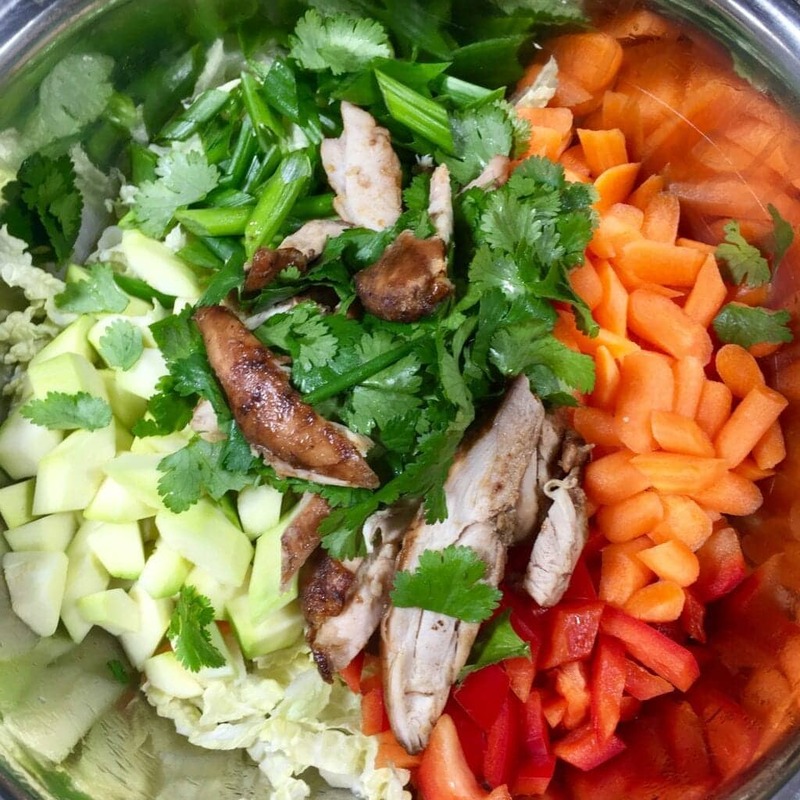 For the Salad: Add cabbage, chicken, carrots, scallions, cucumber, red pepper, and cilantro leaves to a serving bowl. 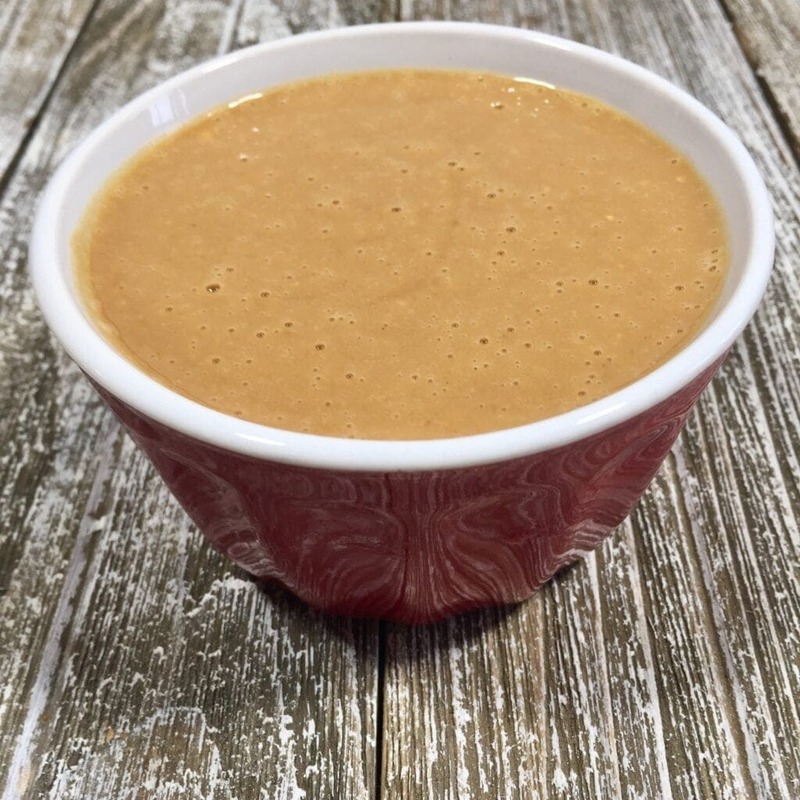 For the Peanut Dressing: Add peanut butter, rice vinegar, lime juice, vegetable oil, sesame oil, soy sauce, honey, garlic, ginger, salt and red pepper flakes to a food processor and mix well to blend. 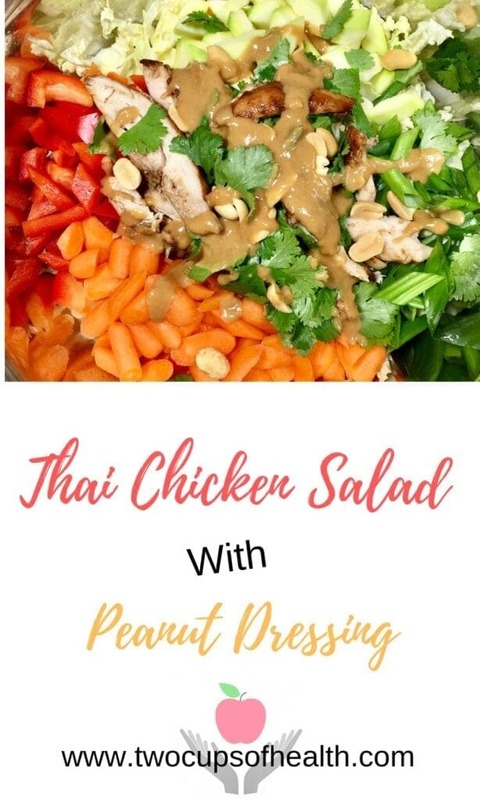 Drizzle Peanut Dressing over the top of the salad and top with peanuts and additional cilantro.